The National Retail Federation projects that people will spend $7.4 billion for Halloween this year. 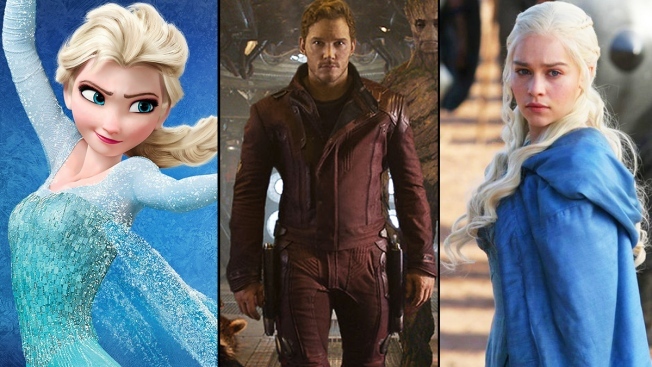 Three top Halloween costumes this season were inspired by movies and TV: Elsa from Disney's "Frozen," Star-Lord from "Guardians of the Galaxy," and Daenerys Targaryen from "Game of Thrones." Streets and sidewalks across the country will soon be filled with Elsas, Daeneryses and Leonardos. That's if this year's early trends in Hollywood-inspired Halloween costumes hold strong through the arrival of the Oct. 31 holiday, and can stave off the growing interest in Ebola-inspired attire. The popularity of Disney hit "Frozen," HBO series "Game of Thrones" and a big screen revival of "Teenage Mutant Ninja Turtles" are driving costume sales for Trick-or-Treaters across age spectra, retailers say. The National Retail Federation estimated that 2.6 million children will dress up as a "Frozen" character, such as Snow Queen Elsa or Olaf the snowman, while about 1.8 million will choose crime-fighting reptiles Leonardo, Michelangelo, Donatello or Raphael. Seventy-five million adults are expected to pick a traditional get-up, such as a Batman, a pirate or a witch, retailers say they're seeing more requests for costumes inspired by some of the season's hottest TV shows and films. "Without question, outfits inspired by movies and TV are the ones that have been flying out the door versus any pop culture sensation like Miley Cyrus," said Holly Botsford, public relations manager for BuyCostumes.com. Angelina Jolie as Maleficent, Jennifer Lawrence as "Hunger Games" heroine Katniss Everdeen or "X-Men's" Mystique, Black Widow from "Captain America" (Scarlett Johansson) and Zoe Saldana as Gamora from "Guardians of the Galaxy" lead Fandango's list of top-rated movie-inspired female Halloween costumes. The movie ticket site surveyed more than a 1,000 film fans in the first week of October to discover Groot (Vin Diesel's character in "Guardians of the Galaxy"), Captain America (Chris Evans), the Ninja Turtles, Star-Lord ("Galaxy's" Chris Pratt) and Dracula were the most nominated male characters. 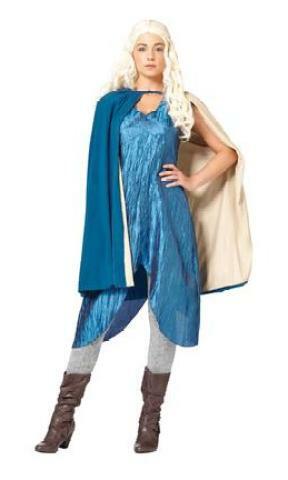 Spirit Halloween has named "Game of Thrones" and "The Walking Dead" characters as their top trends of 2014. The chain, which bills itself as North America's largest seasonal Halloween retailer, partnered with HBO to license outfits inspired by both shows. "Game of Thrones" character Khaleesi, also known as "Mother of Dragons." “Those two series are very popular and are also very good for costumes,” said Lisa Barr, Spirit’s senior director of marketing & creative. The Hollywood trend has been seen in popular couples costumes like Khaleesi and Khal Drogo from “Game of Thrones," and the fictional character Rick Grimes and a zombie outfit from “The Walking Dead." Want to dress your baby? Retailers say the character Olaf from "Frozen" and Teenage Mutant Ninja Turtle looks are popular costumes for infants. Pets? Cats and dogs can also join in on the fun with a "Despicable Me" minion costume or outfits inspired by "Ghostbusters." Fandango's top-rated kid's costumes for 2014 in descending order are Olaf, a minion, the Ninja Turtles, "Frozen's" Elsa and Spider-Man. A trending, though arguably insensitive, costume idea has even received its own Hollywood spin. Ricky's, a beauty shop chain in New York City that offers a wide range of costumes, has received Ebola costume requests on a daily basis, President Richard Parrot said. Although they have decided not to offer one, customers have been using hazmat "Breaking Bad" suits as a substitute. Too soon? Not at web retailer BrandsOnSale. They offer an Ebola Containment Suit costume for $79.99. "You are sure to be prepared if any outbreak happens at your Halloween party. This will literally be the most 'viral' costume of the year," reads the outfit's description. "We don't stray away from anything that's current or controversial or anything like that," BrandsOnSale chief executive Johnathon Weeks told The Associated Press. Though Weeks admits the costume has been received with outrage by some members of the public, he says it is now the item on his site most shared on social media. Overall, consumers are expected to shell out a lot of cash on Halloween, with The National Retail Federation projecting that people will spend $7.4 billion in 2014. The organization's president and CEO Matthew Shay said in a news release that "there will be a record number of consumers taking to the streets, visiting haunted houses and throwing unforgettable celebrations."